Expedition Everest from the north side route is popular mountain expedition in the world. It is the easier climbing route in compare to Mt. Everest south face. Mt. Everest is the tallest mountain in the world (29,029 feet/8,848 meters) and an incredible challenge and experience. Satori Adventures offers a full service expedition of this world renowned peak with a medium number of climbers and a 1:1 climbing Sherpa/guide to each climber. We are committed to providing the highest level of support with strong and experienced climbing guides and Sherpa support and the best high end gear. The first attempt of Everest from the north side was by a British team in 1921. George Mallory led a small team to be the first human to set foot on the mountains flanks by climbing up to the North Col 7,003 meters (22,975 feet). The second expedition, in 1922 reached 8,321 meters (27,300 feet) before turning back. This was also the first team to use supplemental oxygen. The 1924 British expedition with George Mallory and Andrew “Sandy” Irvine is most notable for the mystery of whether they summated. If they did summit, that would precede Tenzing and Hilary by 29 years. Mallory’s body was found in 1999 along the north side route, but there was no proof that he died going up or coming down. A Chinese team made the first summit from Tibet on May 25, 1960. Nawang Gombu (Tibetan) and Chinese Chu Yin-Hau and Wang Fu-Zhou, who is said to have climbed the Second Step in his sock feet, claimed the honor. In 1975, on a successful summit expedition, the Chinese installed the ladder on the Second Step. Tibet was closed to foreigners from 1950 to 1980 preventing any further attempts until a Japanese team summited in 1980 via the Hornbein Couloir on the North Face. There have been 4,428 total summits of Mt. Everest up to 2014. Why Mount Everest Expedition with Satori Adventures? Satori Adventures always offers an incomparable level of competency, safety, and comfort in the Everest north (Tibet side) expeditions. In the mountaineering, small group size always allows us to adapt to changing conditions and weather far more easily than many commercial teams, which have become so large over the last five years that they have become difficult to manage. As per our previous experience there are only 2-3 summit windows allow by nature because of weather condition. Satori Adventure always supply and provide fresh and nutritious food at base camp, provide request types of hygienic food above base camp. We always supply sufficient of Mask, regulator and bottle of Oxygen that add up to a far more enjoyable experience and successful climb. We follow itinerary is made possible by utilizing per-acclimatization in hypoxic tents. For Everest Expedition, the climbing Guides of our company are highly skilled, time to time reviewed and recognized by worldwide due to their training and experiences in this profession and paid up the high range of wages and fees. To these guides and climbers in our Everest Expedition we are going to put on a rope with. This is a serious climb with serious consequences should things go wrong. So, one of the most things we have to keep in mind while operating Mt. Everest Expedition is prevention. 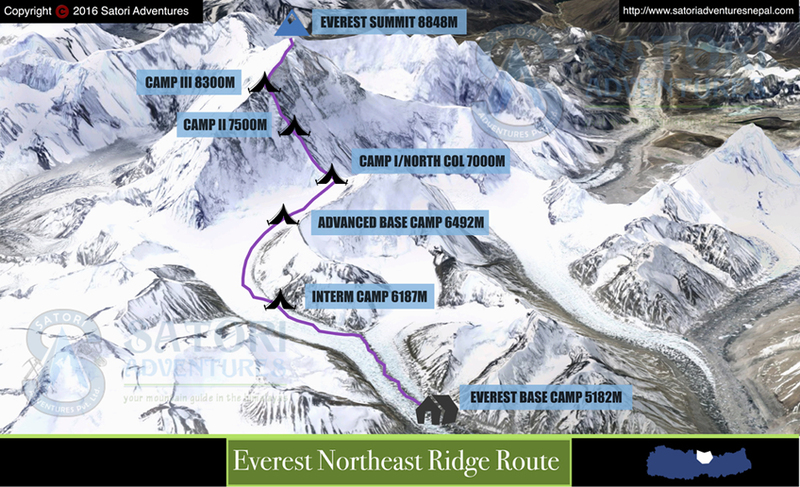 The route on the north side of Everest begins at the Chinese Base Camp (5,150 meters which is located at the Rongbuk Glacier. The Chinese Base Camp is accessible from Tingri by jeep. We offer very competitive cost for climbing the Everest from north face. Our professional service in highly affordable cost with insuring the maximum success rate of summit is our major moto. You will found safety with highly professional mountain base camp and climbing service from Kathmandu to Tibet. Located on a gravel area 8 kilometers above Rongbuk Monastery, this is the end of the road. All vehicle assisted evacuations start here and there are no helicopter evacuations possible in Tibet. Everest Base Camp is a term that is used to describe two base camps on opposite sides of Mount Everest. The North Base Camp is in Tibet at 5,150 meters (16,900 ft) latitude of 28°8′29″N and longitude of 86°51′5″E. These camps are rudimentary campsites that are used by mountain climbers during their ascent and descent. Climbers typically rest at base camp for several days for acclimatization to reduce the risks and severity of altitude sickness. The intermediate camp is used on the first trek to ABC during the acclimatization process. This is no more than a resting place for the night where a few tents are placed. This area can be lightly snow covered, or with no snow at all depending on the weather. Most climbers only stop here ascending to advance camp from base camp. When descending you can walk from ABC to BC in about 6 hours’ time and this camp will not be necessary. Advanced Base Camp on the north side of Everest is one of the highest advance base camps in the world. This position makes it shorter and easier for climbers to reach camp I, II and III from advance base camp. Most teams will use ABC as their primary camp during the acclimatization period, but due to its altitude, some climbers may need to descend to the intermediate camp to acclimate. ABC may or may not be snow covered and offers stunning views of the North Col.
Camp I is located just above the East Rongbuk Glacier. Most climbers will use crampons upon reaching the glacier. Within an hour of starting the ascent on the glacier, climbers will begin to utilize a fixed line and cross ladders that are placed over deep crevasses. In some areas the use of an ascender on the fixed rope will be very helpful. Rappelling, or arm-wrapping techniques are used to descend the steeper areas of this section. Generally climbers will spend 4-5 nights at camp I during the expedition. The route to Camp II consists of a steep and snowy ridge that eventually turns to rock. High winds are sometimes a problem during this section making it especially cold. The wind and air pressure is usually higher on the north face side versus the south side. Some expeditions use Camp II as their highest camp for acclimatization purposes before beginning the summit push. Camp III is located along the steep area of the mountain that runs from 8,250-8,350 meters. There are a few small areas in this location to set up camp III and different expeditions will select different areas in the same general area. This area is steep, rocky and exposed and tents are perched on rock ledges and generally battered by the wind. Camp III on the north side is 350 meters higher than the South Col and much more exposed. Most teams use this high camp as the last rest spot before the summit bid. Summit: 8,850 meters (29,029 feet) 9-13 hours. From camp III to the summit is a really long and hard day. Climbers use a fixed rope through a snow filled gully, which is part of the Yellow Band. From the Yellow Band, the climbers change their oxygen cylinder and take a small ramp up to the northeast ridge. The route veers to the right of the high point and most climbers rate it as steep and challenging. From the Mushroom Rock, located at 8,600 meters, the route can be full of loose rock adding to the difficulty. The next part of the climb is the Second Step, which is the crux of the climb, as climbers use the Chinese Ladder. Climbers first ascend a 10 foot rock slab and then climb the near vertical 30 foot ladder. This section is very exposed with a 9,000 foot vertical drop. Generally it is more difficult to navigate on the decent since you cannot see your foot placement on the ladder rungs. Strong climbers take 9 to 10 hours to reach the summit and return to camp III, while more moderate and less experienced climbers take 11-13 hours. Most climbers use 3-4 bottles of oxygen during the summit push and another bottles between camp II and III. 8-10April/Day 2-3: Free day, Visa collection, Rest and prepare day for assignment and briefing. 15 April/Day 08: After breakfast drive from Tingri to the Chinese base camp (4800m/15750ft.) . camping accommodation. 22 May/Day 55: Clean Chinese Base Camp then Drive to Tingri(4,348m/14,268ft) takes about four hours. 23 May/Day 56:Drive from Tingri to Kerung Height(3200m/10499ft) overnight at tea house accommodation in B/B plan . 24 May/Day 57: Early in the morning drive from Kerung height to Kerung border, finish immigration formalities to cross the boarder and then drive to Kathmandu,transfer to hotel. 25 May/Day 58: Free day in Kathmandu and Nepalese cultural program with farewell dinner in the evening. We provide a personal climbing Sherpa guide to help the clients reach the summit. The secret of success on Everest is a strong and experienced climbing Sherpa. No matter how good and experienced the climber, it is a long slog. Personal climbing Sherpas will set up camp 1, camp 2 and camp 3. They will also carry food provisions, fuel and oxygen and will guide and assist the client on the summit day. All arrival and departure transfer services to and from International airport with Kerung boarder transport as per itinerary. Satori Adventures representative assistance at the International airport both arriving and departing. Land transportation from Kathmandu-Kerung-Kathmandu for all climbing members, Sherpa, guides and kitchen staff as per itinerary. (if we need to entry and exit from Lhasa we provide Kathmandu-Lhasa-Kathmandu flight with additional cost. Three Night hotel accommodation in Lhasa if we need to entry and exit from Lhasa. Kitchen tent, sleeping tents, dining tents, toilet tents, tables, chairs, and cooking utensils at Base Camp and Advance Base Camp. B/B plan hotel accommodation (Bed and breakfast) along with available Hotel/ Lodge/Guest Houses along the trail provided by China Tibet Mountaineering Association. Tent camp accommodation will be provided during climbing members as per itinerary. Climbing members have 50-60 kg baggage allowance from Chinese Base Camp to Advance Base Camp and return carried by Yaks. Tibet Visa and road permit for members, climbing Sherpa, guides and kitchen crew. Experienced, trained, Government Licensed, and 3 time Everest Submitter Expedition Guide/ (Sherpa) per members (1:1 ratio). All wages, equipment, medical and accidental insurances for all involved staff in trekking and expedition. Satellite phone carried by Guide for communication and available for members with the cost of U.S. $4 per minute call. Fixed and dynamic rope during climbing period. Emergency Oxygen mask and regulator provided with appropriate charge. All tents for camp 1, 2 and 3. All charges for staff and high altitude climbing Sherpa guide. Gamow Bags (Portable Hyperbolic Chamber) in case of emergency. EPI cooking gas, stove will be provided in camp I, II and III for cooking food and boiling water. Expenses incurred towards usage of landlines, mobiles, Walkies -talkies or satellite phones And Internet expenses. Summit bonus for personal climbing Sherpa/guide. In the Base camp our cooks and helpers will prepare and serve three delicious freshly cooked and plentiful meals a day and will ensure that hot and cold drinks are available 24 hrs a day. In the Base Camp we provide spacious expedition quality personal tents for all our clients both with full board or base-camp service only.In base camp we also provide dining tent, kitchen tent, toilet facilities and portable shower facilities and tent accommodation for our staff. Satori Adventures representative assistance you at the International airport both arriving and departing. 5 Nights Yak and yeti or similar hotel accommodations in Kathmandu on B/B basis. All kitchen tent, stores tent, dining tents, toilet tents, tables, chairs, and cooking utensils at Base Camp and Advance Base Camp. Tents camp (camping) accommodation during climbing period for members and staff as per itinerary. Tibet Visa and road permit for member and kitchen crew. All wages, equipment, medical and accidental Insurances for all involved staffs in trekking and climbing. Appropriate food for high altitude and all climbing crew at base camp and advance base camp. Heater will be provided at Advance base camp for heating at the dining room. Wake talkies & Filming permit (only for special filming camera only). Why climb Mt. Everest with Satori Adventures? It is important for each climber to choose the right expedition guide service that not only suites their needs, but provides the best safely and secure mountaineering experience possible. There are more than 1,700 trekking companies in Nepal who offer 8,000 meter expeditions including Everest, but only about 30 companies who operate 8,000 meter peaks on a regular basis.We are proud to be one of these 30 companies and consistently offer, run and succeed at these types of expeditions year after year. We are always striving to develop and grow our operational systems to ensure you get the best possible experience. Our expedition members do not deserve anything less than the best possible conditions and opportunity to be successful. We do this by limiting our team size, which makes us more flexible as a team and helps ensure the team has the best weather windows for a summit push. We also try to develop an atmosphere where members feel that they are climbing as a family with each guide Sherpa and team member working together and striving for a common goal.We generally accept a maximum of 8 climbers in a group and if we get more than 8, we will spit the team into two or more groups. The Satori Adventures methodology and tactical approach to climbing Mt. Everest has seen us achieve the highest success rates. Our extensive experience gives us the edge when it comes to making tactical decisions.We provide a consistently higher Sherpa and Guide ratio than any other operator, resulting in more support and backup for your summit attempt, which provides a greater safety margin and chance of success. We always provide a 1:1 ratio of client to Sherpa/guide. Satori Adventures provides the best possible camp facilities, food and service. Our expedition cooks are regarded as the best in the business, provide healthy and appetizing meals with an array of menus to suit all your nutrition requirements. Our cooks provide meals that are designed to sustain your body for the rigouts of the ascent. We also provide diverse choices to suite Vegetarian, Vegan, Indian, or any specified requests. ; If you do have a special nutritional request, please let us know 60 days prior to the start of your expedition so we can plan accordingly. The approach on its Everest North face ridge Base camp is through the Kodari Boarder of Nepal leading up to Rongbuk Glassier. It starts with the drive from Kathmandu to Kodari Border After immigration formalities, drive to Naylam(3700M), to Tingri (4,300m) to Chinese Base Camp (5,150m). It takes typically 10days to reach ABC from Kathmandu.